If you are visiting Disneyland in California with a toddler there are so many rides and attractions to make them, and you, happy. Disneyland is a magical place for anyone, but especially for the 5 and under set. Surviving Disneyland with toddlers does present it’s own unique challenges. From diaper changes to the need to NOT be stuck in line, to potentially coping with tantrums. 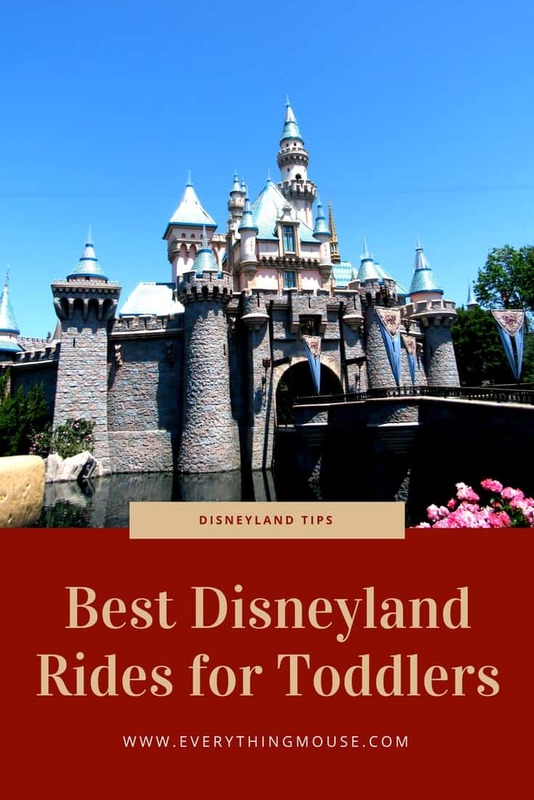 After many years of experience of taking my kids to Disneyland here is my take on which rides and attractions will keep your toddler happy. Whether your 3 or 93, this is a perfect ride for your toddler and family to do together. 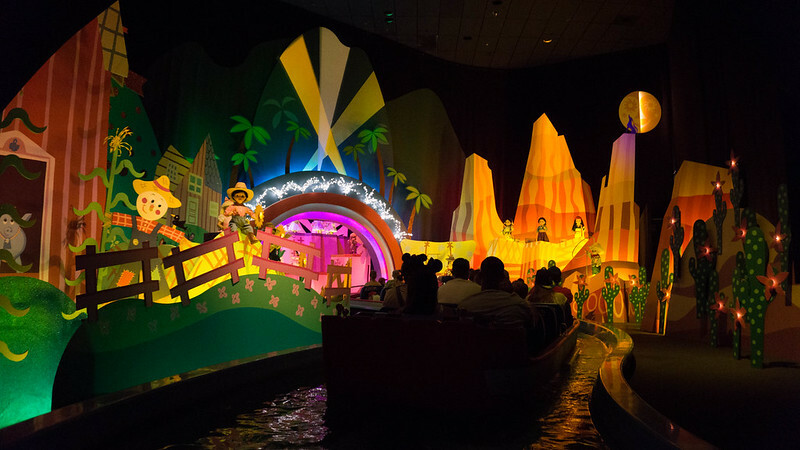 The It’s A Small World boats have recently been updated and are bigger and more comfortable, so your family can ride in style. In addition, they’ve added Disney characters to several of the countries, so your toddler will love looking for new and familiar characters along the way. They will love to Find Nemo and look out for the Disney Princesses. Tip: Get in the far right line. It may look longer, but fewer people take it so it’s often much quicker. The left line is also for those with mobility issues, which may slow the pace down a bit. Yes the line for Dumbo can get long, but toddlers love it. Each rider is given a “magic feather” when they get close to the front of the line, which is then handed to the conductor. 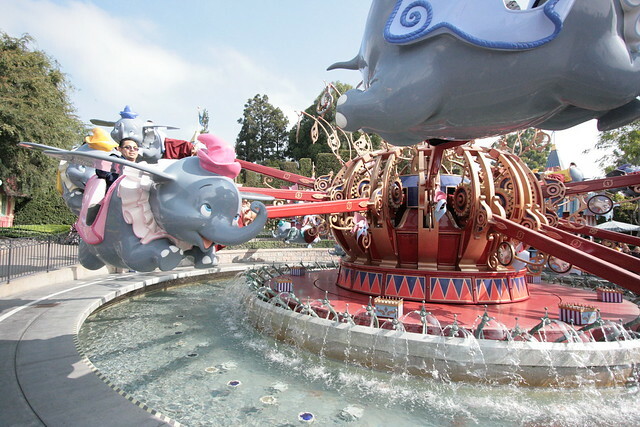 You get to control the movement on Dumbo and how high you fly, so with younger children you can stay at a lower level. The ride does jerk up or down when you change levels. However, this seems to be much scarier for the parents than the kids. Dunbo is always a favorite with the little ones. Tip: Go on the Dumbo ride first thing in the morning or wait until the evening. During the parade is a great time. Once the wait time goes past 20 minutes, it won’t go down until much later in the day. For a similar ride, check out Flik’s Flyers in California Adventure’s “A Bug’s Life”. The wait time is often less than 10 minutes. 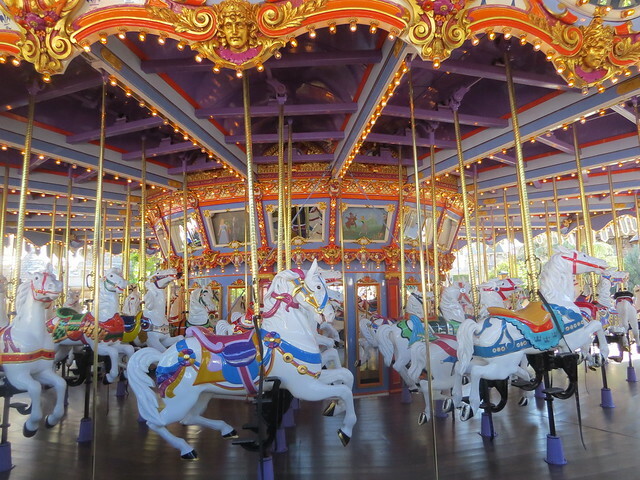 King Arthur’s Carousel is an authentic antique carousel located at Disneyland Park. It features 68 galloping white horses. The ride recreates the great charge of the legendary Knights of the Round Table and their brave leader, King Arthur of Camelot. The wait is usually short, which means you can ride it again and again. Tip: A similar carousel, King Triton’s carousel, is located in California Adventure Park, and features sea animals (dolphins, sea otters, whales) and is even more colorful. It’s next to California Screamin’ and is a perfect spot to hang out while the older kids in your group are enjoying one of the scariest Disney rides of all! Note: Many of the rides in Fantasyland are quite “dark” and can be too intense for little ones. This includes Snow White, Alice in Wonderland, Pinocchio, and Mr. Toad’s Wild Ride. Peter Pan is fine, but often has a huge line, which is why it’s not in my Top 10. All kids love Buzz Lightyear Astro Blasters and I confess it is one of my favorites too. You’ll find the ride in Tomorrowland, across from Star Tours. The wait is usually less than 15 minutes, and once inside you see Buzz bigger than life, urging you to help him in his quest to fight the evil Zurg. You and your child get to spin around shooting Zurg and his evil robots. WHen my eldest son was a toddler he no idea that he was actually meant to shoot at the targets, but he loved the bright lights and sounds. At the end of Buzz Lightyear Astro Blasters you can email a picture of yourself to your home. Tip: If you want to get a higher score, concentrate on the triangles and diamonds. They’re worth 5,000-10,000 points. 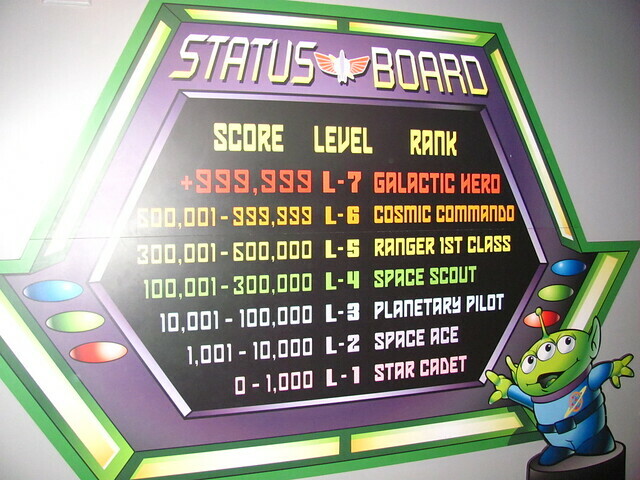 If you can get Zurg himself, he’s worth 100,000 points! I find Toy Story Mania in CA Adventure even more fun. However, you need to get there first thing in the morning or it’s a huge wait. Winnie the Pooh, that huggable, loveable bear, is a toddler favorite. Sandwiched near the Splash Mountain entrance and the Hungry Bear Restaurant, it’s a perfect place to hang out while waiting for others to finish their rides. 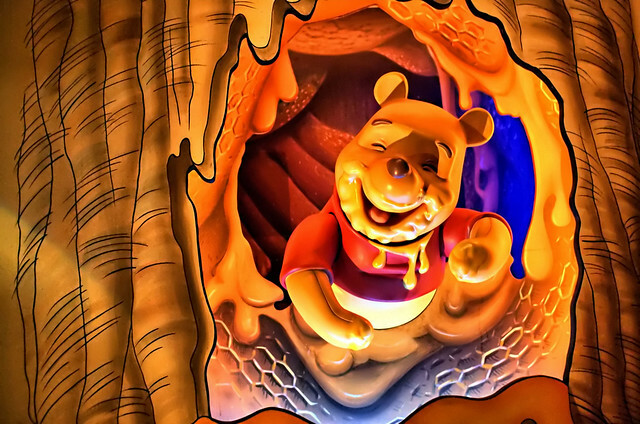 You climb aboard a beehive dripping with honey and ride off into the Hundred-Acre Wood for four minutes of hijinks and fun. Tip: Wear something white and during the dark portions of the ride your clothes will glow in the dark. This is a terrific distraction if the darkness seems too intense for the little ones. Also, if you walk to the right of the exit you’ll find Pooh, Eeyore or Tigger. The meet and greet line isn’t as long as some other areas. However, if your toddler’s shy they can just happily wave to the Disney characters from the fence. Whether your feet are tired, or you just want to take a break, hitch a ride on the Disneyland Train. An old fashioned Victorian locomotive, it goes completely around the park. 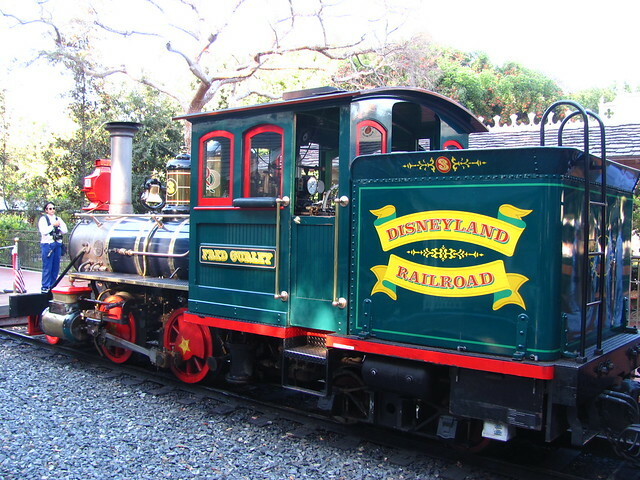 The Disneyland Railroad stops on Main Street and in New Orleans Square, Mickey’s Toontown, and Tomorrowland. Walt Disney loved trains and was often found riding in the conductor’s seat. Sometimes the line can be long but if you walk pass the main car, you can usually find a seat in a car further down. The Disneyland Railroad is a great place to take a rest. With any luck your toddler may have a nap. Unless it’s August and 100 degrees outside, this attraction rarely has a long wait. 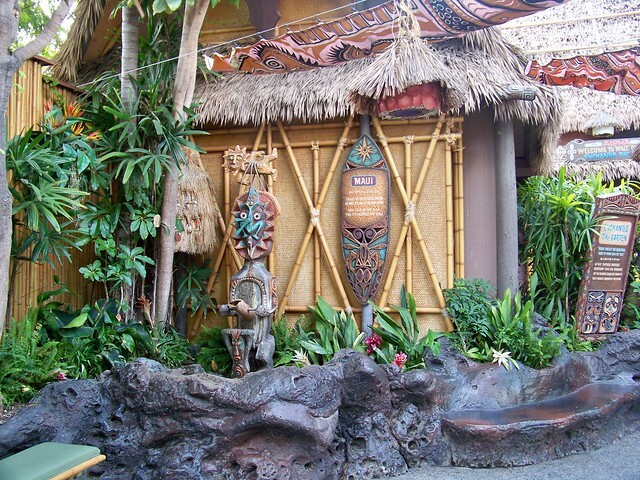 You’re ushered into a small, air conditioned room filled with enchanted birds, plants, and tiki torches. The birds come to life right in front of you and your toddler is completely enthralled, or asleep, which often happens. Either outcome is fine with me! The songs are a little corny, but it’s so pleasant and comfortable inside that you just don’t care. Many little princesses come to Disneyland for the express purpose of meeting one of their own. Rather than be spread out throughout the park, all the princesses now come together in the Royal Hall to meet their little fans. The Royal Hall is located in Fantasyland. Tip: Check the times before you go. During the off season the Disney Princess Fantasy Faire is closed on some dates. Sometimes the lines can be very long, but try and go during a parade as sometimes the lines are much shorter. There are so many things to do with your toddler in Disneyland. What is your favorite ride for toddlers in Disneyland? Leave me a Comment below!